The loops of this library are not only considered to be used 1:1, but they still leave enough room to encourage your own creativity and eagerness to experiment. So they do not only find perfect use as noise clicks in Minimal Techno productions, but also subserve nicely as top loops in many other genres. All loops are commonly produced on 127 bpm and are available in all popular sampler formats. The sound designer behind this sample pack is Oliver Schmitt aka Sounds of Revolution, well-known for his extensively used ‘Revolution sound set / sample pack series’. 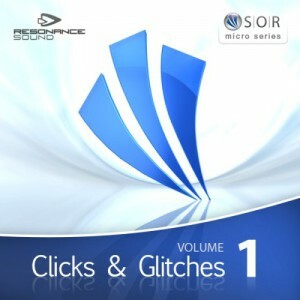 ‘Clicks & Glitches’ is the first edition of a new, attractively priced and versatile useable ‘SOR micro series’. Please note: Some sounds used in Demo 2+3 are taken from other free SOR sample collections also included in the sample pack. productions. While waiting for more soundfood, maybe successors of ‘Club Revolution 1’ and others, we came across a new mini series: smaller packages, but just as useful and precious as always: ‘Abstract&Weird’ and ‘Clicks&Glitches’. Interesting. Let’s do this! The product titles pretty much say what’s inside: you won’t find a huge main loop collection and some standard percussion samples – these sample packs are taking care of the subtile but yet extremely important part of a decent track: they offer everything you need to perfectly fill the sonic gaps in your track plus to add the special touch to make it (even more) unique. Clicks & Glitches is a really lovely package to work with: all those extremely groovy, special click sounds are provided as basic loops, meaning that you don’t get perfectly grooving loops but truly inspiring material to work with: everything inside a loop is perfectly processed, but you have to work on most of the loops to make them fit into your track ? which isn’t of any disadvantage at all! ‘Clicks&Glitches’ makes you instantly cut, copy and rearrange the loops – at least it inspired our creativity from the very first moment. For every fan of electro house and progressive, for sure also other genres, there’s no better collection of these kind of sounds. Beide Libraries bieten für einen absolut attraktiven Preis unverbrauchte Loops an, die sich fast in jeder Produktion gut machen können. Es sind keine Loops, die man nur auf Techno oder Minimal beschränken sollte. Als treibende ?dreckige? Elemente können sie sowohl in Techno, Minimal, Pop, Rock oder auch Schlagerproduktionen verwendet werden. Es spart einem einiges an Zeit, das diese Loops trotz des geringen Preises in allen wichtigen Formaten vorliegen. Da kann manch teurere Library sich ein Beispiel dran nehmen. Die Qualität der Loops ist wie gewohnt hoch und als Sahnehäubchen packt OIiver Schmitt noch etliche kostenlose Loops seiner anderen Libraries dazu. Daher kann ich der neuen ‘micro series’ von SOR nur den Redaktionstipp und meine uneingeschränkte Kaufempfehlung aussprechen. Well, this is something different. I have never reviewed a ‘micro pack’ before and this is the first, though certainly not the last. This pack lives up to my expectations, with some pretty useable esoteric loops that can add a little ‘extra’ to your compositions. It’s primarily geared for minimal techno but other electronic music producers can benefit from this as well. All loops are recorded in the standard 127 BPM and are offered in different formats such as 24-bit WAVs, REX, Apple AIFF loops, plus EXS24 and Kontakt 4 patches. Clicks and Glitches Vol.1 comprises 100 loops (107 MB) that can also serve as top loops for drum mixes lacking that certain charm. A hundred loop library and for only 10.92 Euros (plus tax/VAT)…. you can’t go wrong with this.